I had mentioned this incredible dessert in my latest Instalife Post + wanted to make sure I got it posted for you guys in time for the holidays. 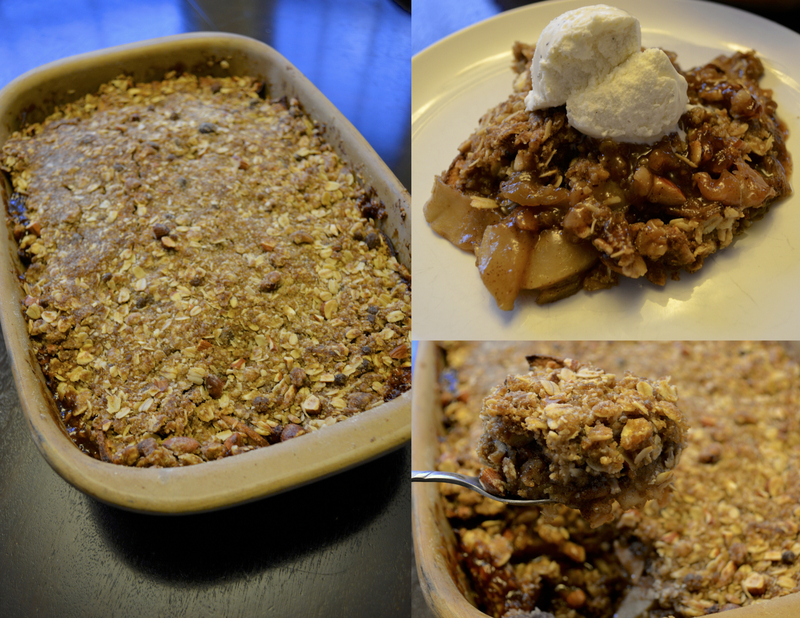 This is my go to apple crisp, complete with browned butter, tart + gooey cinnamon flavored apple slices and LOTS of crumb topping. What I love about this is that you can throw it all together ahead of time + just throw it in the oven the day you need it, which is what I did for Thanksgiving. I love dished like this that are no fuss on the day of + this travels well so it’s perfect dish to bring to a party or your family’s Christmas dinner this year! If you’re going to bake your crisp right away, preheat your oven to 350. Grease a 9 x 13 baking dish. Next you’re going to make the topping. This is going to seem like a ridiculously excessive amount of topping (and it is!) but remember that some will get mixed into the filling and once it gets baked down it won’t be as much! Combine 2 cups all purpose flour, 2 cups old-fashioned oats (not quick oats!) + 2 cups dark brown sugar in a large bowl and toss to combine. You can use your hands to break up any clumps of brown sugar that may be in your bowl! Add in 1 cup chopped almonds (or whatever nut you prefer!) and mix again. Cut 2 sticks of softened unsalted butter into small pieces and add it to the mix. Use your hands to cut it into the topping until the mixture feels like wet sand. Set aside. The best part of the filling is the browned butter. Last year I added some bourbon to it as well but this year I just did the butter and it’s still amazing! Place 2 sticks of unsalted butter in a small saucepan over medium heat. Allow the butter to melt, and then foam and then continue stirring and watching it. Once the butter starts to crackly and smells nutty, remove it from the heat and put it in a bowl to stop the cooking and allow it to cool. 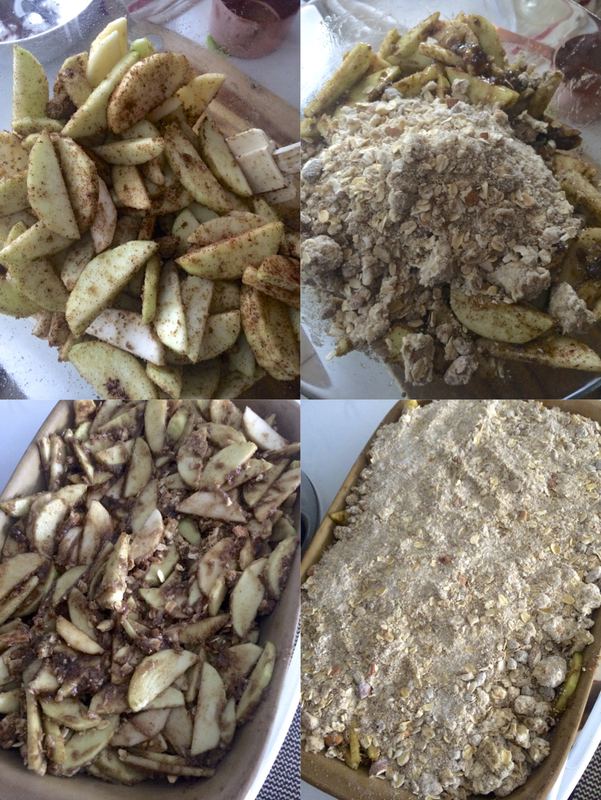 While that is cooling you can peel, core and slice up 12 medium sized apples. I like to use a mix of granny smith and Cortland apples but you can use any combination of apples you prefer. To the apples add 2/3 cup dark brown sugar, 2 tbsp ground cinnamon, 1 tsp fresh ground nutmeg and the cooled browned butter. Toss to combine then add 1 cup of the topping to this mixture and toss again. Put the filling in your greased baking dish + top with the remainder of the topping. If you are making ahead of time, cover with aluminum foil + keep in the fridge. When you’re ready to bake it, take out of fridge and let come to room temp for about an hour before baking. Bake at 350 for about an hour until bubbly inside and crisp on the top. Serve warm with ice cream! Preheat oven to 350 degrees and grease a 9 x 13 baking dish generously. 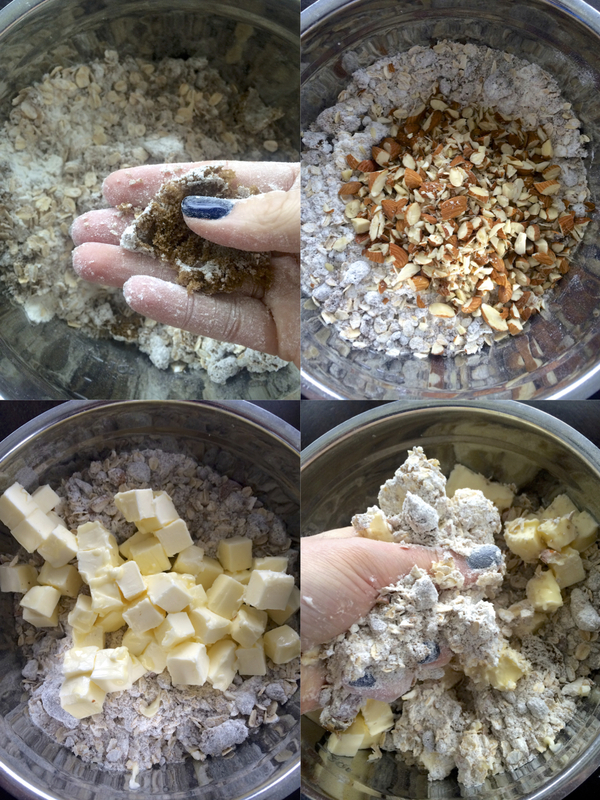 Combine flour, oats, brown sugar, + almonds in a large bowl and toss to combine. Cut butter into small pieces and add it to the mix. Use your hands to cut it into the topping until the mixture feels like wet sand. Set aside. Place butter in a small saucepan over medium heat. Allow the butter to melt, and then foam and then continue stirring and watching it. Once the butter starts to crackly and smells nutty, remove it from the heat and put it in a bowl to stop the cooking and allow it to cool. Mix the apples with brown sugar, cinnamon, nutmeg and the cooled browned butter together in a large bowl. Toss to combine then add 1 cup of the topping to this mixture and toss again. Put the filling in your greased baking dish + top with the remainder of the topping. Thank you! It is SO delicious… one of my favorite desserts!